For a few weeks each year, already dazzling Kyoto becomes even more charming as its scenery is enveloped in delicate cherry blossoms. 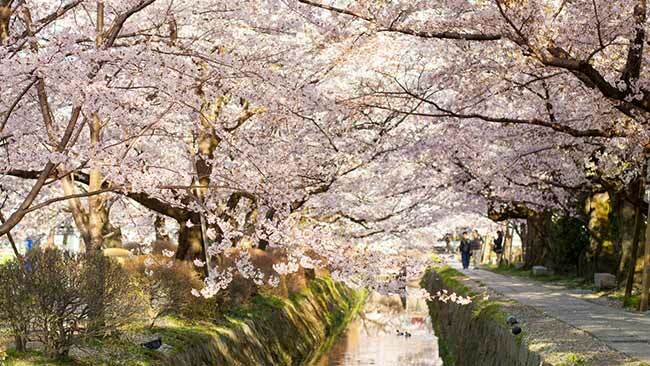 Here are 10 places in Kyoto the beauty of these cherry blossoms can be truly appreciated! The extensive grounds of Daigo-ji, a temple famed for its cherry trees since old times, comprise nearly 1000 trees that bloom in spectacular color. The cherry trees include the weeping cherry, Somei Yoshino, mountain cherry, and double-flowered varieties and bloom over 3 weeks, making Daigo-ji a unique location with plenty of opportunity to enjoy its cherry blossoms. 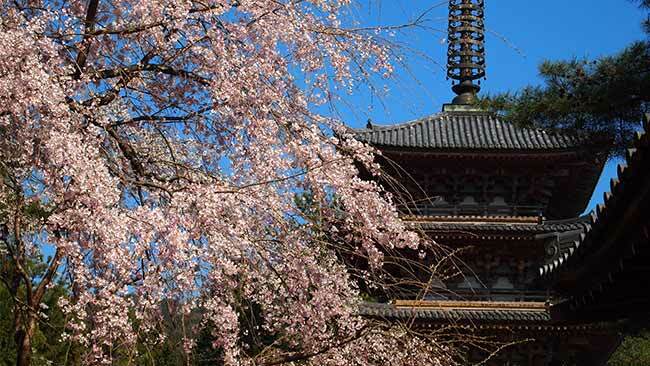 Ninna-ji is home to a grove of Omuro Cherry Trees well-known for being the last to flower in Kyoto. 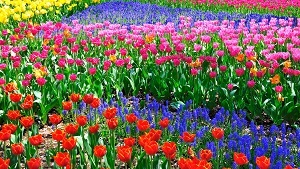 When in full bloom, they are said to mark the end of spring in Kyoto. 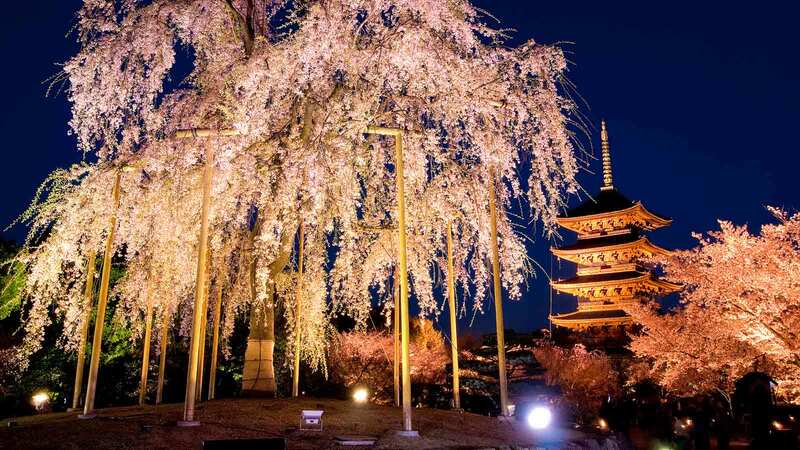 The shorter trees which stand at around 2 meters are ideal if you want to enjoy cherry blossoms right before your eyes. 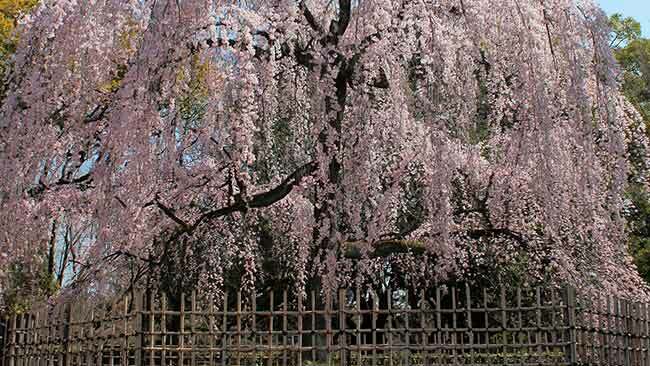 Standing centrally in Maruyama Park is a large weeping cherry known famously as the Night-time Cherry of Gion. Lit up at night, the park is a popular and lively spot that attracts large crowds for night-time cherry blossom viewing. 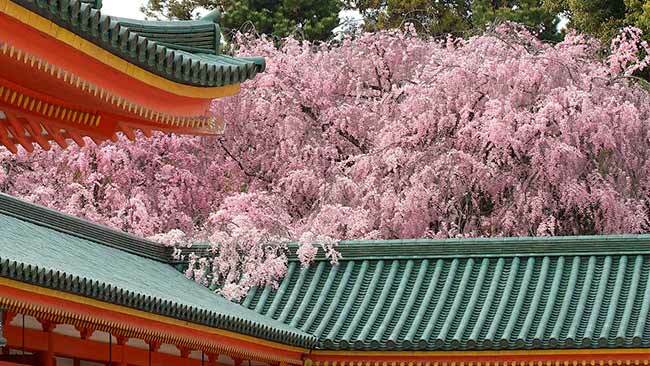 In the vast shrine gardens encircling the main shrine building, colored brightly in red and green, there are wondrous double-flowering cherry trees with deep crimson blossoms. When in bloom, the blossoms create a canopy under the sky. 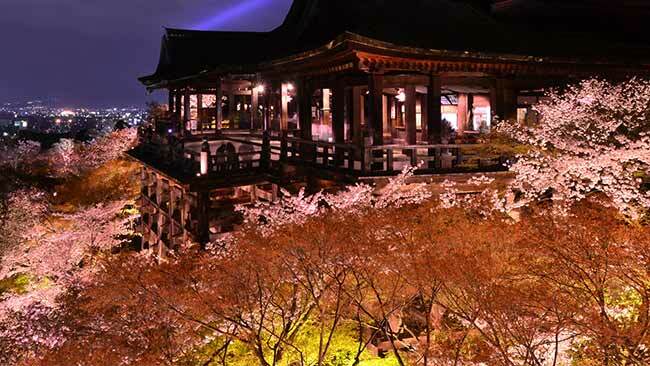 A UNESCO World Heritage site, the ancient temple of Kiyomizu-dera is one of Kyoto's leading cherry blossom spots, with nearly 1500 mountain cherry and Somei Yoshino trees. The view of the trees from the temple's observation platform is spectacular. 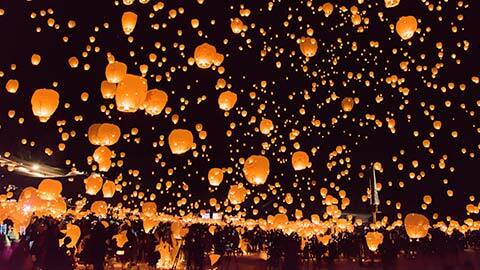 The blossoms can also be admired at night when they are illuminated, creating a beautiful and romantic scene. 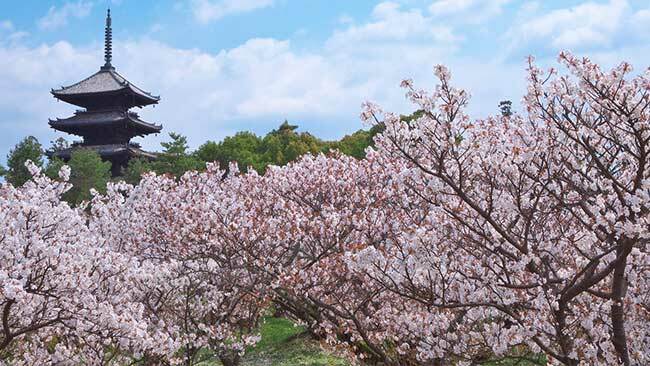 Nearly 400 trees of 50 different varieties spread out across the castle grounds, attracting large crowds eager to admire the beauty of Nijo-jo's cherry blossoms. 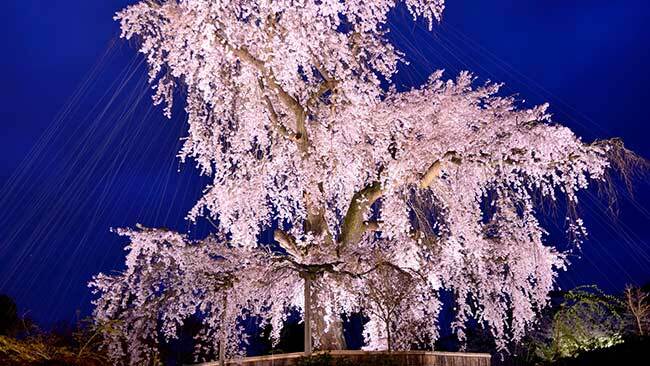 During the castle's light-up event, the cherry trees and gardens are bathed magnificently in light. 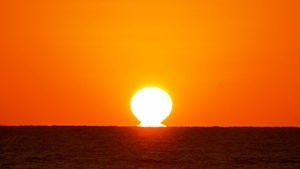 The result is a world of delicate beauty. The Philosopher's Walk is a path following a small canal and covering a distance of nearly 2km. In bloom, the cherry trees color the path in romantic pinks that stretch as far as the eye can see. The tunnel they create when in full bloom is moving, but the petals dancing on the wind as the blossoms begin to fall is also particularly beautiful. 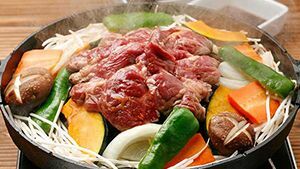 Kyoto Gyoen is located almost directly in the center of Kyoto and surrounds the Kyoto Imperial Palace. 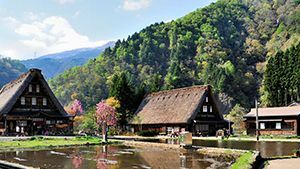 Vast gardens with a circumference of 4km are planted with scores of cherry trees (nearly 1000) offering visitors the opportunity to enjoy the cherry blossoms of several varieties, including the elegant weeping cherry. 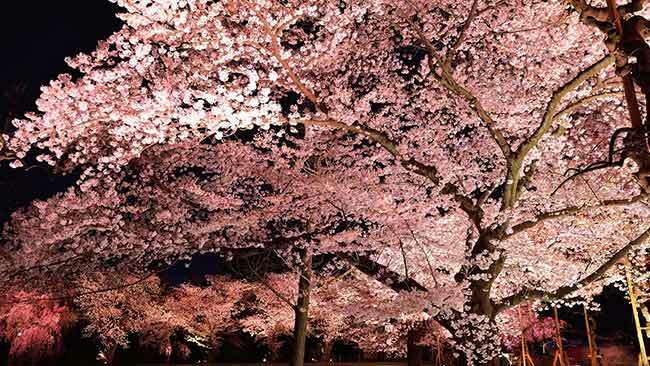 Cherry trees were first planted in Hirano-jinja during the Heian Period (794-1185), symbolizing a deity that strengthens life force. 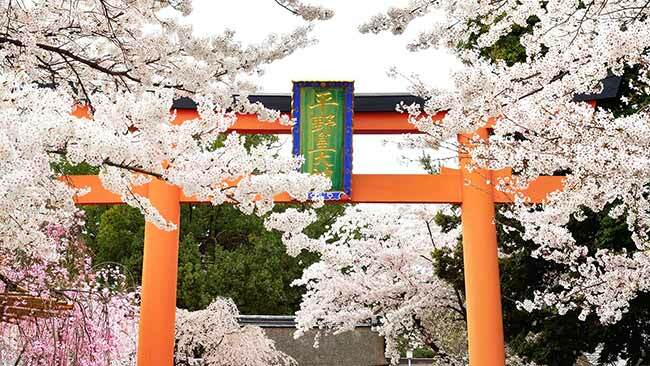 400 trees of nearly 60 varieties can be found in the shrine's grounds, with many rare species blooming one after another in such a show of vitality, it's as if they have been waiting solely for this moment. 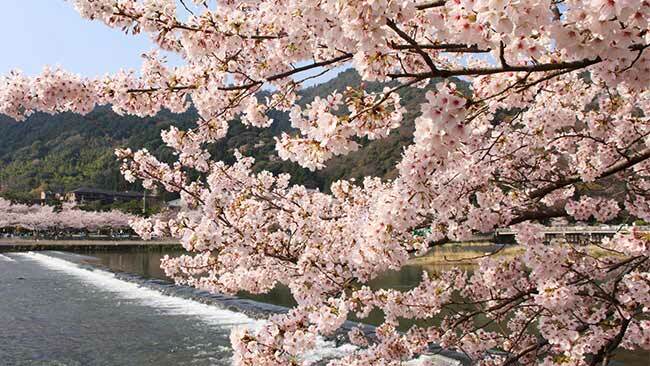 When the cherry trees are in full bloom, the entire mountain of Arashiyama is painted in pinks and greens creating an exquisite contrast. This view from across Togetsu-kyo Bridge is a must-see! 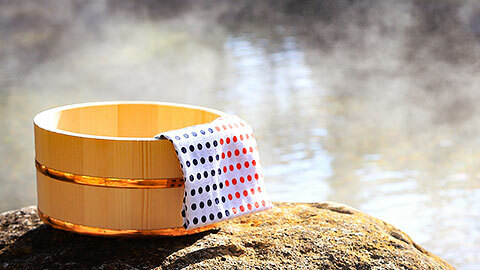 The Arashiyama area is also dotted with unique shrines, shops selling souvenirs, and places to eat and drink. 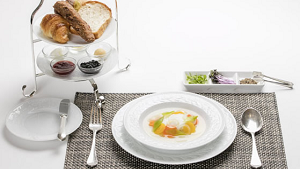 It is ideal for an enjoyable stroll.